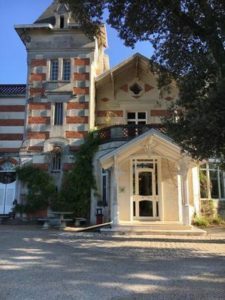 Nestled in the heart of the Cognac vineyards, Hotel de l’Yeuse is a charming 19th Century property offering a warm welcome and a pleasant stay in the Charente region. It is an ideal base to relax and enjoy the region’s Cognac houses and the beautiful town. Just 10 minutes by road from Cognac, Hotel de l’Yeuse benefits from a tranquil and rural location in the Charente countryside. The nearest airport is Bordeaux, which is 1 ½ hours’ drive. The hotel’s peaceful surroundings allow for a serene and restful stay in the region, whilst remaining close to the town of Cognac and world-famous Cognac Houses such as Rémy Martin, Camus, Hennessy and Courvoisier. Everything that you should need for an enjoyable trip is readily available at Hotel de l’Yeuse. The hotel boasts an on-site gastronomic restaurant, an outdoor swimming pool, a sumptuous spa and a stunning “Respectful Garden”, a verdant showcase, designed to preserve biodiversity. Cognac lovers will delight in the well-equipped Cognac library for post-dinner drinks. One of the hotel’s greatest assets is the multi-lingual staff, who will go above and beyond to accommodate the requests of every client. 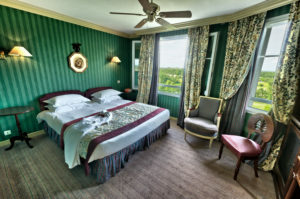 There are 24 rooms at Hotel de l’Yeuse and grades range from Classic to Suites. The rooms are located in the main building or in the newly-built, more modern wing and some of the guest rooms offer a spellbinding panorama over the Charente Valley and its vineyards and villages. Each room is decorated elegantly and is equipped with satellite TV, WIFI internet access, Air-conditioning and heating, a mini-bar and en-suite facilities.